LOL! I also read in Taxi's diary that his "aunties" and others didn't want anyone to cut his mane and bangs (forelock). Taxi also has a beautiful Long Tail for a race horse. Actually, under another thread Latest From The Vault I posted an article about Whirlaway who was known for his very long tail. His trainer (Ben Jones) believed that the long flowing tail would help ward off other horses approaching from behind him as the long flowing tail would act as a deterrent...like a whip in the face or legs. Remember that mare at the equine hospital in Australia? Hers would have been touching the ground if it hadn't been cut--you could see that it had been cut because the end was straight across, blunt cut, not tapering naturally. I prefer the natural look. Look how beautiful Zenyatta's tail is in the poster picture below. She is perfection. Not only is it a European thing, but Bobby Frankel always had the tails of his horses cut that way too. You can tell who a certain trainer is just by looking at their horse in the paddock - i.e. all of Pletcher's horses wear white bridles. Oh. Interesting. Most of John Sherriffs' seem to wear nose rolls. I believe that it's supposed to expand the nostrils of the horse so that it can breathe better/inhale deeper so you can get maximum performance out of your horse. This is I'll Have Another wearing an Equine Nasal Strip to help his breathing during the races. O'Neil was not allowed to use this nasal strip on the final leg for the Triple Crown. So ironic that the other horses were allowed to have Lasix in their systems during the Belmont Stakes race. I would think that the nasal strip would be the least invasive aid to help a horse breath better...no ingested drugs (ie lasix)...no harm to the horse's system. Belmont has their priorities screwed up...they should let them all use nasal strips and not lasix instead! But that is just my novice opinion. I believe it's also illegal for horses racing in New York? Or so I have heard? Okay, now I know the horse racing industry and the regulators are crazy. Shoot, football players wear them all the time. Not equine nasal strips, but human ones. I didn't know they make them for horses. I sure wish they made them for cats; my poor Callie suffered with her allergies for about 10 of her 19 years. I've been wearing those nasal strips since they were invented. I think they are the greatest invention including sliced bread. I used to have to get allergy shots, and use nose drops which had bad side effects, but with the invention of Breathe Right strips I can sleep at night and breathe without medication. They absolutely should allow horses to use them, esp if they prevent bleeding so they could do without Lasix which has deadly side effects. Nasal strips have no side effects and are natural. I hope they reconsider this, esp. since they are allowed in human sports. My doctors even allowed me to wear nasal strips during two major surgeries. I'll Have Another always ran with Lasix in his system. If you check his PPs for his previous races he always had Lasix. My question is, if the strips are helpful in preventing bleeding, then why is O'Neill using Lasix too? The nasal strips helps the horse to "breathe" better by opening up the nasal passage-to get more oxygen into their system naturally. The strips do not help to stop bleeding. We use it ourselves as mentioned by VA_in_CA to breathe better while sleeping to prevent us from breathing through our mouths (ie snoring) and to open the airway for people who suffer nasal inflammations caused by allergies. It's Lasix that stops bleeding in certain horses...but what is a tragedy is that most race horses who are non-bleeders are given this drug anyway just to boost their performance and is allegedly used as a masking agent for other drugs. And...as mentioned earlier, it has been medically confirmed that the use of Lasix causes the loss or imbalance of several nutrients...As with many diuretics, it causes dehydration and electrolyte imbalance, including loss of potassium, calcium, sodium, and magnesium! Repetitive usage over time can also be detrimental to the renal system (kidneys). A single dosage of Lasix takes awhile before the horse's system can regain physiological balance...probably why race horses these days cannot race as often as in the good old days. Michael Matz is another trainer who cuts the tails straight across and he also came from eventing where its done a lot. Yes! He represented the United States during the Olympics! In Show Jumping. I think he carried the USA flag on the opening night for the Equestrian Events. But... Gotta check on this tho'. OK...he represented the US in the 1976, 1992 and 1996 Olympics. In the 1996 Olympics...He won a team Silver Medal on Rhum IV. He also was chosen to carry the US flag into Centennial Olympic Stadium at the "Closing" Ceremonies of the 1996 Games. He was inducted into the Show Jumping Hall of Fame in 4/1/2006. Paniolo_Gal, I did know that. I really like him and have never heard a bad thing about him. I really hope he has another chance with a good horse. He deserves another big winner! I'll never forget his face when Barbaro got hurt. So Sad! I did not know this. Thanks for telling those of us not in the know, Paniolo_Gal. Q. How do you decide to give a horse time off? A. There are several reasons to turn a horse out. Primarily, they need a physical rest like any athlete. There might be a soreness or injury requiring rest, mental burn out or the simple fact that rest and a change of scenery can do the mind and body a world of good. Q. Do you regularly give all of your horses time off? A. I try to give every horse I train 2-3 months off every year. Some need more, some less. 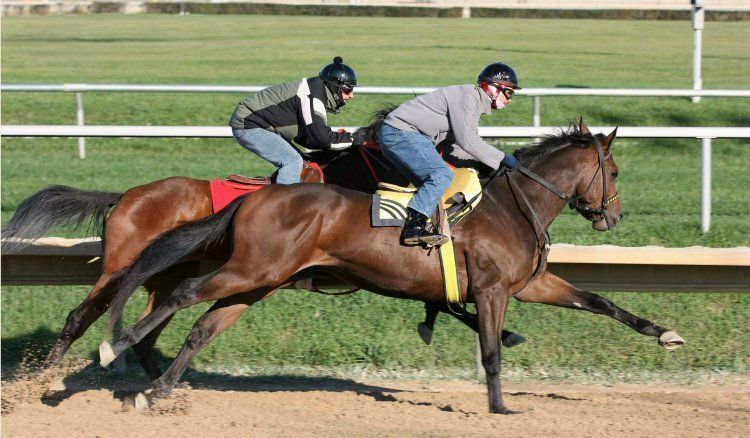 Taxi worked out again yesterday and hopes to make his first start of 2014 on March 2nd. There is a current blog post about his progress for those of you who are interested @ blogs.courier-journal.com. I have met him and he acts exactly as he is described.